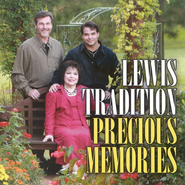 Members of THE LEWIS TRADITION include Janis Lewis Phillips, youngest daughter of Mom and Pop Lewis and her son, Lewis Phillips, Travis Lewis, son of the late Wallace Lewis, and Travis' oldest son, Jameson. Janis was a Lewis Family member from the group's earliest days; Travis from 1974 and Lewis from 1977. Though he performs only on special occasions, Earl Phillips, Janis' husband and Lewis' father, is a retired bank executive and extremely important to the group as business manager, a post he filled for The Lewis Family beginning in 1967. He never fails to delight audiences with his songs and subtle humour. As members of the former Lewis Family, THE LEWIS TRADITION members have won prestigious honours that include membership in the Georgia Music Hall of Fame, Grand Ole Gospel Reunion's Living Legend Award, induction to the Gospel Music Hall of Fame and The IBMA Hall of Fame, both headquartered in Nashville. They proudly carry on the tradition of America's First Family of Bluegrass Gospel Music.